Bangalore: He examines the grape vines and cuts fruiting branches or spurs and shoots, limiting each to four spurs. The plants should bear 12-14 bunches of grapes each, not more. V.S. Patil, vice-president (vineyards) at Grover Vineyards Ltd, gives his all to reduce the number of grape bunches from each plant so the berry is rich in flavours and aroma, essential to making good wine. Grover, like other Indian winemakers, is paying more attention than ever to the quality of wine as customers become more discerning and low-quality grapes go waste. “Ninety per cent of a wine is in the grape," says Patil, who holds a doctorate in agricultural sciences and heads a dozen-strong team of agricultural science postgraduates who supervise Grover’s 450 acres of vineyards on the outskirts of Bangalore and Bijapur in Karnataka, and Sangli in Maharashtra. In the world of viniculture—the science of growing grapes for making wine—good grapes cannot make bad wine. The idea of restricting yield is alien to Indian farmers used to celebrating bumper crops. To incentivize the farmer, Grover will, for the first time, pay per acre rather than per kg of grape. The company aims to cut the yield per acre from 3-3.6 tonnes to 2.8 tonnes in a few years. 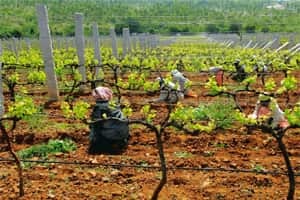 “Internationally, reputed wine companies restrict yield to three-four tonnes a hectare and in India we are struggling to restrict it to three-four tonnes an acre," says Heemanshu Ashar, a Bangalore-based independent wine consultant and wine taster. About 2.4 acres make up 1 ha. Ashar says not enough attention is paid to choose the right grape varieties or to match the plant to the soil type and water table. There is also a dearth of staff trained in viticulture, the science of growing grapes, and oenology, the science of wine and winemaking. Earlier, winemakers didn’t concentrate on grapes, says Achyuth Niphade, winemaker and production manager at Nashik-based ND Wines Pvt. Ltd. They “just used to harvest and make wine". ND Wines, too, is working to reduce the yield on its 200-acre vineyard in Nashik from five tonnes per acre to four tonnes in the next one-three years. Wine companies also aim to reduce the foreign elements used in growing grapes, such as fertilizers and pesticides. While ND Wines has reduced pesticide levels by 10% over the past three years, so fewer chemicals seep into the grape and the wine made from it, Grover Vineyards plans to do the 2010 harvest sans fertilizers. In India, grape is typically harvested in April-May. Others like Bangalore-based Chateau de Banyan Ltd, a subsidiary of John Distilleries Ltd, is investing in upgrading the winery, moving from multi-purpose tanks to single-purpose tanks for wine fermentation, cold stabilization and storage, and replacing a semi-automated bottling unit with a fully automated one. This, hopes Michael D’souza, winemaker at Chateau de Banyan, will help in the aging of the wine. Currently, most Indian wines do not age well; “after two years it turns into vinegar" due to a variety of factors ranging from grape variety to viticultural practices. This is ironical for a commodity that is traditionally supposed to improve with age. Ashar believes India needs to experiment with different grape varieties from warmer countries to go up the quality spectrum. “We need to study warmer countries like Latin America or Spain and their local grape varieties," says Ashar.